The Around the House Flash Cards help you teach children to read and identify 10 items in the house, 10 possessions in the house, 10 food items, and 10 animals commonly seen around the house. This set contains 40 flash cards with a word on one side and a full color image on the opposite side. Children are often already familiar with many of these words, and enjoy learning about objects which they are able to recognize in their own environment. Each flash card displays a word on the front and a full color image on the opposite side. This is very useful for aiding babies in understanding what they are learning and what the words mean. 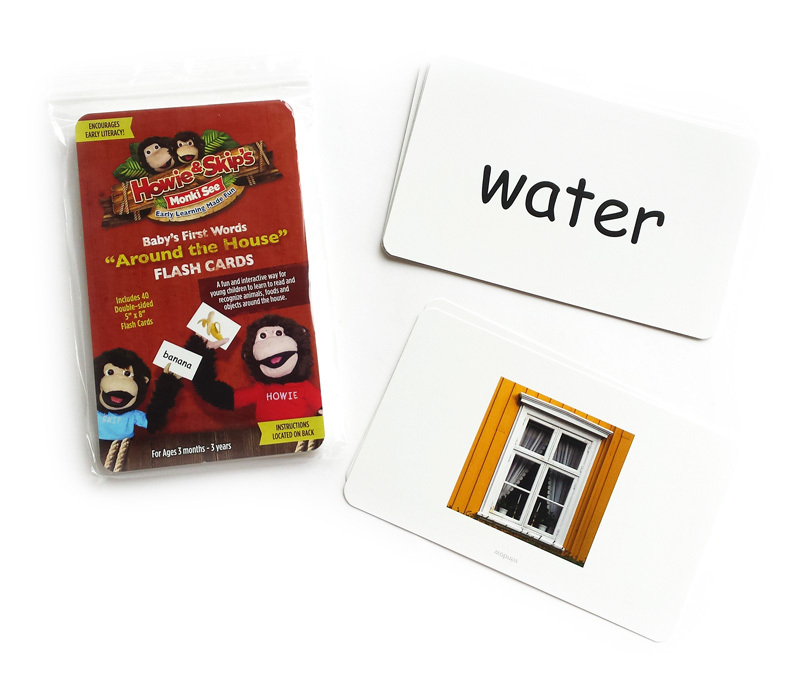 These oversized flash cards are easy to handle which makes them ideal for teaching young children to read. The words should always be shown first, and for ease of use and quicker viewing, the flash cards flip forward to reveal the pictures on the back of each card. There are multiple ways to use the cards. You can read more on how to use flash cards here. Teaching children to read with flash cards is incredibly easy, fast, and effective. Young children learn best in short, quick sessions. These sessions take as little as 20-30 seconds each and you would do that 2 -3 times per day. You can teach your baby to read between 10 – 20 words in a week, or more depending on your child’s level of interest. The amount of time you would be investing is about 1 or 2 minutes per day. That is really all it takes. Continue showing your baby the words until you have completed the whole set. Knowing how to read these words allows the child to read more fluidly, without getting tripped up on words. This increases comprehension of what is being read and makes for more confident readers. Sight-reading can lead to an understanding of phonics if it is introduced during the first three years of life. By teaching children to read with flash cards, they quickly learn the words and commit them to memory so they are never stumbling blocks in their reading.